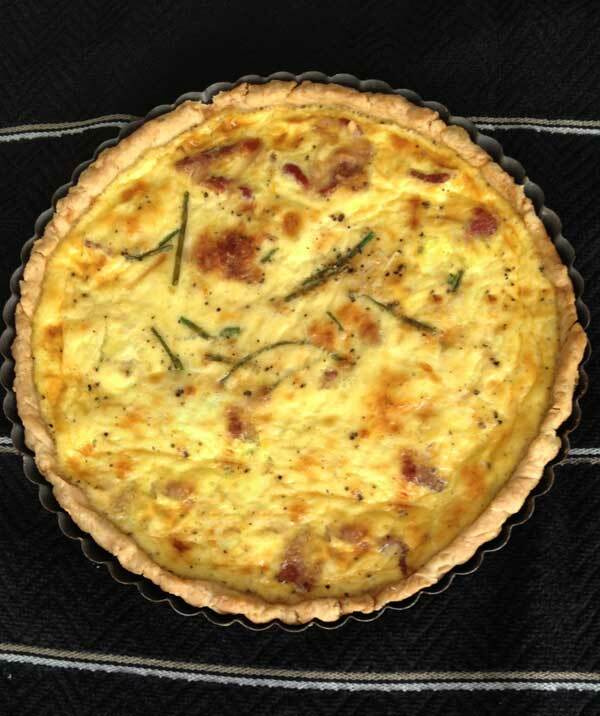 Quiche Lorraine baked in a 9 inch round tart pan. Crust: In a large bowl, stir together the flour, salt and sugar. Add the butter and shortening, and using a pastry blender or your fingers, mix until the mixture resembles coarse crumbs. Add the water 1 tablespoon at a time, stirring gently with scraper after each addition and adding only enough of the water to make the dry ingredients moist enough to hold together. Squash mixture into a ball then press into a disk. Wrap in plastic and chill for one hour until ready to use. On a lightly floured surface, roll the dough into an 11-inch circle. Fit into a 9-inch fluted tart pan with a removable bottom. Chill the pan with the dough for at least an hour or until ready to use. To pre-bake the tart shell, cover with foil and weigh down with pie weights. Set the tart shell on a baking sheet and bake in a preheated 375 degree oven for 15 minutes, then remove foil and weights and bake for 10 minutes. Set crust aside and let cool while you make the filling. Filling: Cook the bacon until crisp, drain the fat and cut into 1 inch chunks. Lay bacon pieces across bottom of the baked tart shell. In a large bowl, whisk together the eggs, yolks, and half and half. Add the remaining ingredients and whisk to combine. Pour into the prepared crust and bake until the custard is golden, puffed, and set yet still slightly wiggly in the center, 30 to 35 minutes. Let cool at room temperature, then keep chilled until ready to serve. You can also make this in a 9 inch pie dish.